Newport has always been noted for its abundance of agate and exceptionally fine, colorful jaspers, because the supply of stone is exposed by our strong storm tides. However 2008 provided some of the best collecting years of probably the last 8 - 10 years, and the best thing about beachcombing, it requires no special tools and it's free! Beachcombing safety tips to avoid accidents and injury: activities here on the coast are often governed by tidal influences. Your SAFETY is priority #1. Always be cautious when near the surf. Those beautiful waves can be dangerous as sudden wave surges or "sneaker waves", with these strong outward currents, wash up on the shore with enough impact to knock an adult down and drag them out to sea. Do not turn your back on the ocean and never play on the driftwood logs. These logs weighing upwards of several tons, become buoyant and can be moved around in as little as just one inch of water which can float and roll over a person causing injury or death to an unaware person. Watch the tides, every 24 hours and 50 minutes the tide rises and falls twice. The incoming tides are the most dangerous to unwary explorers. Therefore beachcombing requires a knowledge of tidal ebb and flow. Variations to predicted tides can be caused by changing weather patterns, currents, wind and wave size. Therefore, it is prudent to use caution around the ocean. The Pacific Ocean, relentlentlessy renews the agate supply every year during the winter and early spring when the storms are the hardiest and the tides uncover great beds of gravel at this time of year. This brings the lighter weight stones characteristic of gem material to the top. The "Discovery Season" from October through April is the very best time to hunt for the fine agates one can find in the area. The mild winters of Oregon's central coast allows for year beachcombing in comfort. The agate hunter should look for loose gravel on top of the sand. 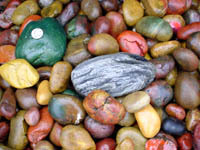 Much of the agate and jasper found on Oregon Beaches will have been worn down until it is rounded into smooth beach pebbles or cobbles. If you look closely at a dry piece of this rock you may see that it is covered with little crescent-shaped indications as though someone had pressed their fingernail into it. Most agates are translucent and when held to the sun or other strong light the formations inside can be seen. It is best to hunt on an out-going tide for it is then that the gravel has been freshly agitated and the stones are most plentiful. Walk into the sun so that you can better see the agates sparkle. It is always easier to see the agate or opaque but colorful jasper when the stones are wet, so start hunting from where the water has recently receded. Keep in mind that because agate is very hard, agate will remain wet and shinier longer than the porous rock, basalt or sandstone pebbles have dried. Rare finds are agates with water and a moveable bubble of air inside called an enhydro and agates that appear to have fine hair-like needles inside is called sagenite. Jasper is an opaque quartz containing oxide of iron, clay and many other impurities and is found in various colors, such as red, butterscotch, brown, green or any combination there of. Bloodstone is a dark-green jasper with small, blood-red blotches. These treasures of agate, jasper and petrified wood are especially beautiful when polished. A rock tumbler will polish them into beautiful gems, that can be made into lovely jewelry. Also, be on the look out for petrified wood, fossil shells of clams and snails plus fossilized whale and dolphin bone. They may be seen embedded in a cliff face, (however do not attempt to remove them from the headlands, as wind and water will erode away the soil). 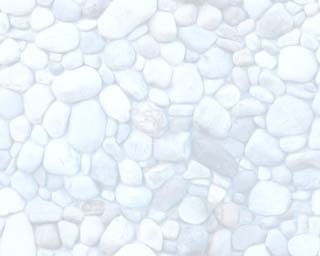 Look among the cobbles washed against the base of the cliffs by the tides. Seldom do you ever see the complete fossil visible, therefore look for interesting contours and shapes. A permit is required for any digging beyond a modest 3" x 6" deep hole. Any fragile vertebrate fossils are to be left untouched and reported to the Hatfield Marine Science Center in Newport at South Beach. Some fossils may not be easy to recognize and they may be taken to the Hatfield Marine Science Center for identification. Users may download this World Wide Web page for personal and educational use only. 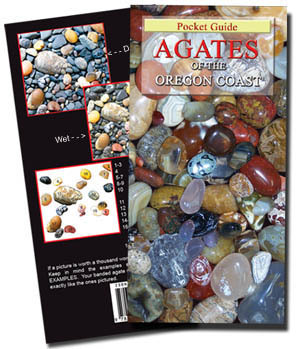 Unless otherwise noted, all descriptions and images, are the property of Agates of the Oregon Coast a publication of FACETS, and may not be copied for commercial purposes. All such copies must include this copyright notice and explicit references to this URL. Copyright © 1999 - 2017 FACETS Gem & Mineral Gallery,LLC All rights reserved.